I want to say that you have an exceptional group of customer service people. I have worked with a number of them. They are responsive, knowledgeable, personable, concerned and always anxious to help. One recent situation called for the involvement of your newly-appointed regional manager. He was here as soon as we needed him, took control of the situation, worked it through and did a thorough follow up. You have a great team and I appreciate it. Thank you. Thank you very much for the extra effort!!! You are a great help and make doing business with DuraTech a breeze. They look great. Thanks for getting them to me so fast. Thanks for the quick turnaround. You are a great vendor! 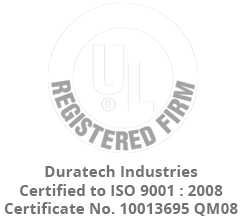 I would like to reiterate that DuraTech Industries is part of my supply base responsibilities and has been a consistent top performer for the Switch Products Division. Thank any and all involved!!! Big hit they are on the parts and in the customers hands in time for the photo shoot this afternoon!!! Thank any and all involved!!! Thank you for the outstanding job you and your team did for us. The prototype labels looked fabulous, nice registration, and the timing and turn around could not have been better. Having never dealt with you or Dura Tech before I was expecting there to be the usual ramp up period until everyone got used to each other and on the same page, but we seemed to hit it off straight away. I look forward to working with you in the future. Thanks for helping us look good. You are one vendor that always comes through for me in the time of need. Another job well done! This was a huge collaborative effort between development and your teams to get this project off the ground and then up and running. Then there was another huge collaborative effort between your teams and the subcontractor to have the product delivered to us when we truly needed them. Our management teams here recognize the effort and willingness to come through for our company. This new product took effort and a constant watchful eye from the beginning to the end and a great job was done by all involved, (from the quoting group, the artwork teams, to the manufacturing line, the subcontractors and the sales team). I appreciated the daily updates from DuraTech’s sales team and the follow-up to ensure that we had product when we needed it. I just wanted to say that the labels you made for us are absolutely gorgeous! I honestly don’t know how you could have improved on this order. You were on the ball….on top of the order and the labels got here as promised. You had absolutely wonderful service. Your company has worked very efficiently to provide us with our product in a fast time frame. Such a Reliable, Fast and Friendly Company! Wow! It’s great to work with such a reliable, fast and friendly company! I can’t wait to see the prototype. I know we are a pain but I really do enjoy working with you and appreciate all of the hard work that you and your co-workers have done for us. DuraTech is a supplier that is a perfect example of what an EXCEPTIONAL supplier should be. Making labels is not always understood by designers. Our company is always looking at ways to control cost, and DuraTech has been instrumental in helping to understand the details of making low-cost labels. Giving design seminars to our engineers and providing prompt customer service have been a few ways to make sure we are getting what we are expecting. Having a good understanding of the end-use, working with different base materials and adhesives gives us the flexibility that we need for our requirements. If it’s a high volume application or just a few pieces for a prototype, we can count on DuraTech to come through. These are the types of services that we have come to expect from DuraTech. They set high standards on their deliverables …. Service, Quality of Product, and Cost are all a big part of the reason for us being a happy customer. Thanks for your prompt and efficient follow up. YOU are one of the main reasons why I send leads to DuraTech. Obviously, I have many accounts in the Midwest that I could take these leads to but because I trust you, the quality of DT’s work and know that things get handled quickly by you is why I continue to send things your way. Everyone who has seen the graphics to date have said something to the effect that they are great in every way. I thank you for all your hard work and will be getting back to you when the opportunity arises. We really appreciate the quick service DuraTech has provided on this project, especially over the past couple weeks during the holidays. 2011 Q2 PPM is ZERO!!!!! Now, that’s world class quality! Great job team! You all are awesome! Our customer service rep is very responsive, warm and always a pleasure to deal with. DuraTech is always on time.